More for me. More for them. More for you. I’m joining the incredibly talented, infamously humorous, infinitely engaging SharePoint team at Rackspace. Jeff Deverter and company have hosted the San Antonio SharePoint User Group monthly meetings at Rackspace for a couple years now and I’ve gotten to know a lot of their smart admins. With the recent addition of the SharePoint911 crew the level of SharePoint talent at Rackspace exploded overnight. If you attend conferences that include SharePoint content, it’s hard not to run into the 6 MVPs formerly of SharePoint911, now Rackspace. 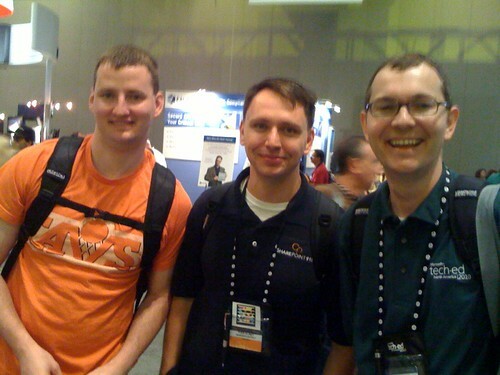 I got Shane and Todd to pause during TechEd 2010 for a picture with me (above) where their SharePoint 2010 Administration book was the most popular of the show. Their book sold out all copies in the Microsoft Bookstore on the 1st day of the conference. I’ll continue to do SharePoint consulting for Rackspace on Shane’s team. And I’ll most likely pursue the evolution of MCM called the MCSM. But one of the things I’m most excited about is the opportunity to do more community events, speaking and writing about SharePoint. Look for a new book from me when Wave 15 hits, a move of TomResing.com to the Rackspace Cloud and a SharePoint Saturday San Antonio announcement coming soon. The SharePoint 911 bios including links to their blogs and twitter feeds. Good for you Tom you’ll be a great asset. Good to have you on board. Too bad that Shane had to be in that picture and ruin it. @Todd Glad to be on board. And glad you won’t have any more “secret” visits to San Antonio now that the aquisition is final. @Adam Thanks! A great job with people you respect and trust is kind of like a reward, isn’t it? Congratulationsk, Tom – you will be a great addition to the team. Congratulations! You guys will be a force to be reckoned with. @Owen That means a lot. @Jack One more Deverter at Rackspace and we’d have a trifecta. That would be a force!